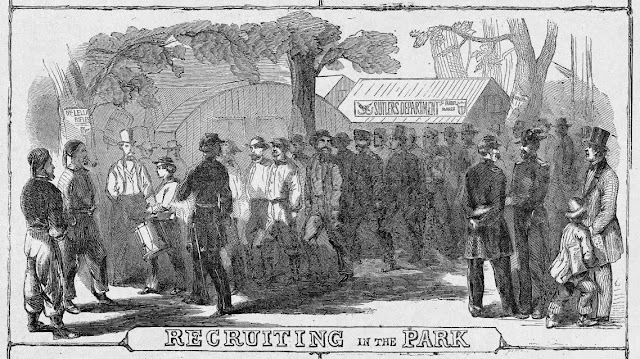 It's been a couple weeks since my last update on recruiting for Colonel Hambright's regiment, so let's go back a little to an update that appeared in the August 26, 1861, Daily Evening Express. (alternate link) For those unfamiliar with how Civil War armies were structured, a regiment was the basic unit of operation on the battlefield with an ideal strength of 1,000 men. It was comprised of ten companies with 100 men each. Companies were the basic unit of recruiting, and men from each company tended to be from the same hometown or from two or three villages. As mentioned in the article, Captain Kendrick's company was filled largely with men from the Jackson Rifles. More on Captain Kendrick in the future and his company, which became Company A.
Capt. Seaver never went off to war, but his company of German-speaking men going off to fight under Lieut. Klein as Company F. According to the article, both of the officers fought in the failed Revolution of 1848 under later Union General Franz Sigel. Seeing the company described as the "German Sharpshooters," I wonder if they had any connection to popular German shooting clubs of the 1850s and 1860s that occasionally were mentioned in newspapers. The company mentioned being recruited by Capt. Haines might have ended up going off to war with the 45th Pennsylvania led by Col. Thomas Welsh of Columbia. Lieut. Michael Locher, operator of a billiard saloon on Centre Square, ended up leading Company H.
Capt. Duchman's company later became Company B. The other companies mentioned did not end up joining the 79th Pennsylvania, and that's another story for another time, probably related to the article's last couple paragraphs about the chaotic process of organizing companies and assigning them to regiments. So, as of August 27, we're looking at the origins of four of the companies of what would become the 79th Pennsylvania being accounted for. More updates to come.